Ukrainian developer Beatshapers has access to Sony's Project Morpheus PlayStation 4 VR headset and various incarnations of the Oculus Rift, but those weren't enough to sate their virtual reality madness, so they strapped a PlayStation Vita to their heads. Speaking to the lovely folks over at Push Square, Beatshapers founder Alexey Menshikov explains how the PlayStation Vita VR headset came about. "Well, that was a really fun semi-research project that we made during our VR experiments," the beaming boss giggles as we pose the question. "Here is the story behind it: I was reading [ex-id Software and current Oculus Rift employee] John Carmack's article about mobile VR performance optimisations, and pondered whether there are any devices that we can use that offer low-level access to the hardware. In that moment, my eyes rested upon the Vita nestled on my desk – and a light bulb went off. 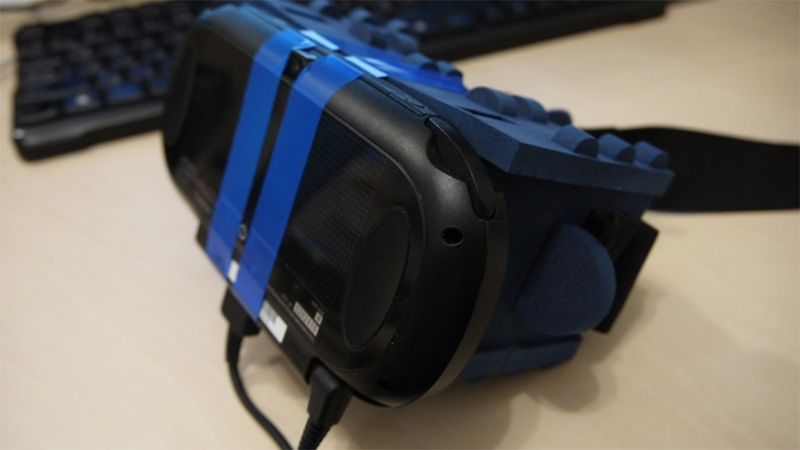 With duct tape, scissors, and a bit of black magic, we made a Vita VR headset." Well, it wasn't quite that simple. They did use duct tape and scissors, but the insides of the headset came from foam producer Stooksy, who produce a pre-made foam VR headset to fit mobile phones. The Vita headset looks like one of those, only with the Vita taped to the front of it. While not as high resolution as the latest Oculus or Project Morpheus, the Vita's gyroscope is perfect for head tracking, and the design allows most of the handheld's controls (save the analog numbs and front touch screen) to be accessed. Imagine using the rear touch screen of the Vita to feel your virtual face. What's this tape doing here. The point is we've entered the age where anything with a long enough screen can be turned into a virtual reality headset by giddy Ukranian dev teams.